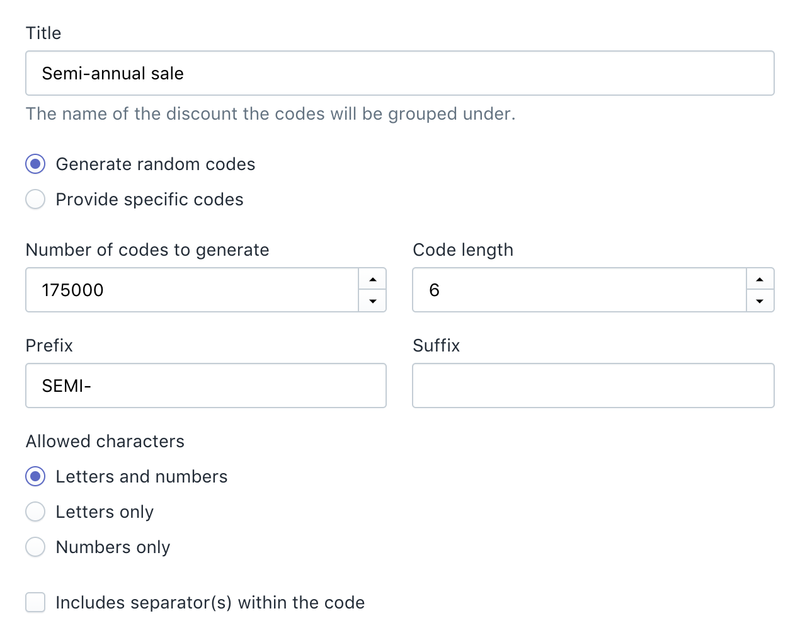 When creating a discount set, you can leverage the generator to automatically create any number of unique codes or you can provide up to 10,000 specific codes at a time to be imported. The generator provides a number of settings to allow customization of the codes, but one hidden feature is our proprietary purifier to ensure no undesirable words end up in your codes. After the discount set settings, you will find the rest of the form very familiar. A replica of Shopify's discount creation form allows you to specify all the discount details right within the same flow so you do not have to hop back and forth around the Shopify admin. To the right of the form, you will be able to see a summary of the discount itself as well as the set you will be generating. Preview example codes and get an estimate of how long it will take to actually import all the codes. We want you to be informed and able to quickly verify your settings before clicking the save button.